Are you sick and tired of flimsy, wobbling ironing boards that feel like they are going to collapse with the smallest amount of weight? Brabantia ironing boards are far from wobbly, in fact, they are the highest quality ironing board that we have ever come across! With Brabantia, you no longer have to hassle with a weak, non-supportive ironing board. On carpets or hard surfaces, Brabantia boards lock into place and and remain secure during use. 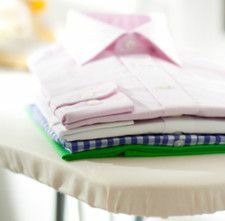 Go ahead and place a full load of laundry on the board to fold, or press down firmly on those stubborn wrinkles! This board will not budge. Brabantia boards are not only strong and stable, but they also offer a great performing iron surface. Each board is made up of a heavy duty coated steel mesh and then covered with a padded cotton ironing board cover. The padded cover prevents marks and creases in the material caused by the mesh backer or the edges of the board. Lastly, when done ironing, simply lift the lever under the ironing surface and the board will collapse for storage. Brabantia is committed to making only the highest quality ironing boards and that is why each one is backed with their 10 year guarantee! If you are tired of wobbly ironing boards that offer no padding, then stop by and check out the full line-up of Brabantia boards. We hope that you will be as impressed as we were and still are.